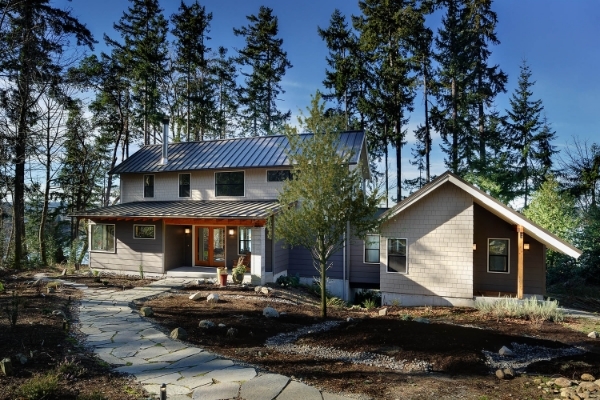 Designed for "empty nesters" as a full-time home and frequent gathering place for their friends and extended family, this Maury Island home balances open communal living with opportunities for the quiet retreat so often desired with island living. The house sits atop a wooded shoreline bluff, looking out over Quartermaster Harbor and Vashon Island beyond. Living spaces have been carefully arranged to take advantage of views and to maximize natural light. Thoughtful use of natural wood finishes, glulam beams and blackened steel gives the house the contemporary northwest styling the clients were after.